Last summer the modern hymn “In Christ Alone” made headlines for its lyrical references to the wrath of God and atonement theology. A hymn committee with the Presbyterian Church (U.S.A.) wanted to add the song to their new hymnal, Glory to God, released this fall. But in doing so, the committee requested permission from the song's writers, Stuart Townend and Keith Getty, to print an altered version of the hymn's lyrics, changing “Till on that cross as Jesus died/the wrath of God was satisfied” to “Till on that cross as Jesus died/the love of God was magnified.” The songwriters rejected the proposed change, and as a result the hymn committee voted to bar the hymn. “The song has been removed from our contents list, with deep regret over losing its otherwise poignant and powerful witness,” committee chair Mary Louise Bringle told The Christian Century. The “view that the cross is primarily about God's need to assuage God's anger” would have a negative effect on the hymnal's ability to form the faith of coming generations, Bringle explained. This was the second time a hymnal publisher attempted to change the same lyric. In 2010, a hymnal called Celebrating Grace printed “In Christ Alone” with the same altered wording about God's wrath, unbeknownst to the songwriters. When the Presbyterian committee came across this version, they assumed the amended lyric was an authorized text and requested permission to use it in their hymnal. The Celebrating Grace hymnal's publisher is now working to address the problem, since the group neither asked nor received permission to alter the text. Interestingly, a host of media outlets ran articles about this story, including USA Today, The Washington Post, and The Economist, speaking to the broad reach of the hymn. According to the Christian licensing group CCLI, “In Christ Alone” remains one of the most popular songs in churches, as their charts indicate it has been the number-one used hymn in the United Kingdom for the past seven years and among the top ten in the United States, Canada, and Australia for almost as long. The song is printed in hymnals and choral publications but also projected on screens, crossing stylistic and cultural boundaries and reaching from mainline churches to contemporary worship movements. It was recently used at the enthronement of the archbishop of Canterbury and also has become an anthem for underground churches throughout the world. Artists as varied as Alison Krauss, MercyMe, Natalie Grant, the Newsboys, OwlCity, and most recently Kristian Stanfill (Passion 2013) have recorded the hymn. Timothy George, the dean of Beeson Divinity School at Samford University, recently said he believes the hymn is well on its way to becoming the “Amazing Grace” of this generation. A few weeks ago a close friend in ministry woke up to learn his 3-year-old son had died overnight with no apparent cause. At the heart-wrenching funeral we sang “In Christ Alone” as an expression of our hope in Jesus and his return. 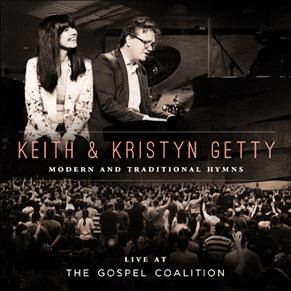 I'm grateful, then, for this opportunity to correspond with songwriter Keith Getty to learn his thoughts about the exclusion of “In Christ Alone” from the Presbyterian hymnal and why he remains committed to the song's original lyrics. “In Christ Alone” has become a formative hymn of our generation. What inspired the song? In 2000, I sat down with Stuart Townend for one of our first songwriting sessions. We'd recently been introduced and encouraged to collaborate as musicians. Stuart's strengths center around an extraordinary ability with lyrics, while mine lean toward composing melodies, though we each enjoy the freedom of speaking into each other's work. As artists, we both brought to the table a conviction that rich theology greatly matters in the songs we sing on Sunday morning, that what we sing week after week ultimately makes its way into every part of our faith and life. I knew I wanted to tell the gospel story in one song, and I'd been working on a particular melody associated with this idea for some time that I shared with Stuart. Through our discussions, I made the suggestion that the hymn be called “In Christ Alone.” Stuart penned the incredible lyric, which outlines the gospel message. It was the first song we wrote together! I believe the lyrics of “In Christ Alone” succinctly express theological truths about the life, death, and saving power of Christ through his sacrificial death on the cross. Yet the song is more than didactic theology. As we've shared the hymn in churches, we've witnessed the passion and emotion it evokes. I think this is what makes it so memorable. In more than a decade now of writing modern hymns together, Stuart and I continue to receive feedback about the effect of “In Christ Alone.” We're amazed and humbled by the way this hymn seems to have connected with so many people on their Christian journey. Hearing how the song has helped others hold fast to Christ, often in times of great crisis and pain, is deeply meaningful and encourages us to continue writing. Believers are hungry to celebrate truth put to music, and Stuart and I are grateful to have played a small part in helping facilitate such opportunities for the church. Two groups wanted to change your lyrics in order to circumvent the idea that God's wrath was satisfied through Christ's death on the cross. Why was it important this lyric not be altered? First, it's important to express how truly honored we feel that these groups would consider adding “In Christ Alone” to their hymnals. We support the approach they take of studying the lyrics of hymns as they select music worthy to be sung and preserved. However, we believe altering the lyrics would remove an essential part of the gospel story as explained throughout Scripture. The main thread of what we see revealed throughout the Old and New Testament is the need for man to be made right with God. The provided path toward reconciliation came through Christ's predetermined and perfect sacrifice on the cross, satisfying God's wrath once and for all. The two hymnal committees wanted to change the lyrics to focus on how Christ's death on the cross magnifies God's love for the world. And indeed, God's love was magnified on Calvary's hill. Yet the way this occurred was through Christ doing for us what we could not do for ourselves—shedding his own perfect blood to atone for our sins. Was the doctrine of propitiation front and center in your mind when you wrote the hymn? We wanted to explore the scope of the gospel message in one song. As people in the pew sing “In Christ Alone,” we pray they understand the many attributes of God. His sovereign power, grace, love, justice and wrath all are intertwined. And we shouldn't turn away from exploring his wrath, because through understanding God's righteous anger toward sin, we understand his desire for justice and peace. As J. I. Packer so clearly explains in Knowing God, God is not just unless he inflicts upon all sin and wrongdoing the penalty it deserves. While we may think it severe, we desperately need God's wrath—a holy and just response to evil—to restore the broken world in which we live. I understand some people take issue with the theological perspective that God's wrath was satisfied through Christ's death on the cross. Part of this debate centers on whether the cross became the object of God's wrath. When couched in those terms, God's anger can sound harsh and perhaps confusing. Stuart Townend and I believe the doctrine of propitiation plays a vital role in how we understand Christ's saving work as explained in Scripture. Consequently, the language used throughout “In Christ Alone” is a natural expression of our theological view on this subject. Why do churches need to be singing a robust view of the atonement? My pastor friend Alistair Begg frequently describes our culture as one whose people carry out lives of quiet desperation. I think he's right. Our world desperately needs the hope of knowing Christ's atoning work is deep and wide enough to cover the most serious sins and utmost despair. These words, as recounted in Corrie's book The Hiding Place are indeed moving and inspirational. But how can we know they are absolutely true? In part, because of the atonement. Because Christ bore for us the weight of the world's sin, sinking deeper into the pit of separation from God than we'll ever comprehend. For this reason, we must sing wholeheartedly about concepts such as penal substitution, as well as the many other attributes of God that unfortunately go ignored in some churches today. The songs we sing have a powerful way of shaping our soul and becoming grafted into our being. This is why my grandfather continued to remember and sing hymns until he died in his 90s. It's also why modern-day American missionary Gracia Burnham softly sang the hymns she'd memorized in her younger years when she was held hostage in the southern Philippines for more than a year by Islamic militants. She had no access to a Bible or hymnal. The words were written on her heart. Truth put to music remains with us. It's why we still sing the powerful lyrics of hymns written centuries ago. Speculation and questioning about theology will come and go, but truth remains. Consider these words of Horatio G. Spafford, penned in 1873: My sin, oh, the bliss of this glorious thought!/ My sin, not in part but the whole,/ Is nailed to the cross, and I bear it no more,/ Praise the Lord, praise the Lord, O my soul! Looking ahead, what is your hope for songs written for the church today? We live during an exciting time in history for believers and for the church. Today there are more Christians in the world than in any other time. More translations of the Bible exist than ever before. Yet it seems the average evangelical knows less about the Bible than during any other period. I believe songwriters have a duty to make sure the Word of Christ dwells richly in the hearts of those in our generation. And part of how this generation will understand its faith is through the words they sing. We need exciting, passionate songs with beautiful lyrics, rich in theology, and infectious melodies that invigorate our congregations. With every line we write and tune we compose, we need to portray a fuller picture of Christ for the people among us. We need not shy away from the hard, mysterious sections of Scripture. Songwriters need to demonstrate a grasp of the whole biblical context. We must not be afraid to write about hard things. Singing songs with more depth allows us to experience the relief of lifting our eyes off ourselves and toward the unimaginable vastness of our God. This is what I pray for myself and for others creating music for the church today. Editors' note: Thank you to Corrie Cutrer for her help in developing this interview.